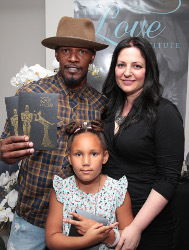 Meagan Holub, Founder of The Love Institute, met up with Jamie Foxx at the 2016 Academy Award Celebrity Gift Bags suite, only a few months after meeting him through friends in Palm Springs. Always and ever the gentleman, he posed with his gift Certificates for a Private Couples Massage Lesson with Katie Holmes, and took a massage candle home for her too, while chatting about our common connection and yelling as he was ushered away “I have your number now, so we’ll call you!” while the other attendees looked on in awe. I mean, who’s cooler than Jamie Foxx? You’re a class act Jamie Foxx, and we at The Love Institute can’t wait to work with you and Katie.